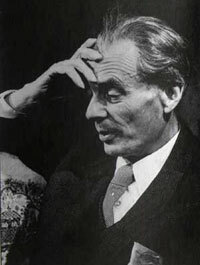 Aldous Huxley was a novelist and essayist, born in Godalming, Surrey, England, the grandson of T.H. Huxley. He studied at Oxford, where he published two volumes of poetry. He lived mainly in Italy in the 1920s, (where he met and befriended D.H. Lawrence) and moved to California in 1937. His early writing included poetry, short stories, and literary journalism, but his reputation was made with his novels Crome Yellow, Antic Hay, and Brave New World. He was a philosopher and non-conformist who used writing as a vehicle for his ideas. His later writing became more mystical in character, culminating in Island, the story of an optimistic utopia. 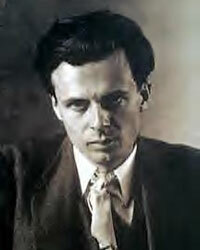 In May 1953, Huxley was introduced to mescaline by Humphry Osmond, an experience he described in his book The Doors of Perception. Two years later, in 1955, he was introduced to LSD by Al Hubbard. Huxley had a great interest in the process of death and dying as well as in the mental states achieved through psychedelic drugs. When his first wife Maria was dying of cancer in 1955, he used hypnotic techniques to talk her through the memory of ecstatic experiences she had earlier in life. Then in 1963, at his request, his second wife and partner Laura Huxley administer LSD to him hours before his own death.